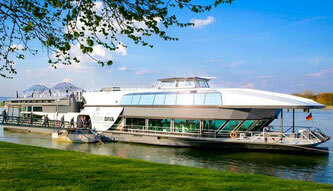 The elegant, life-affirming city on the Rhine stands for fashion, shopping, culture and extraordinary events. From Königsallee – fondly known as the “Kö”, a luxury shopping avenue – it’s just a short walk to the historical Altstadt (Old Town) with its 260 bars and restaurants, said to be the "longest bar in the world". Its flair is famous, its narrow streets are vibrant, and the multifaceted cultural scene produces spectacular events and international trade shows. 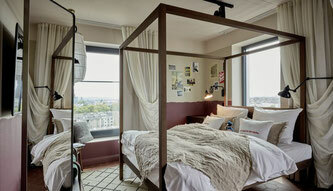 The Boutique Design Hotel Ruby Coco is centrally located at the famous Königsallee of Düsseldorf and persuades its guests with Parisian chic, artistic contrasts and luxurious furnishing in small spaces. A perfect mixture of original details and antiques dating back to the lifetime of Coco’s namesake create an elegant but easy atmosphere. 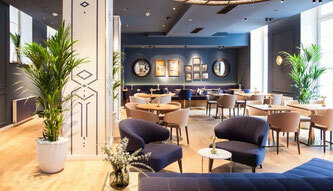 Newly built and opened in 2018, the 25hours Hotel Das Tour offers a modern and artistic interior combined with French charm. Besides 198 stylish rooms and a wellness area, guests can enjoy a spectacular view over Düsseldorf from the restaurant and the bar which extend over two storeys, the 16th and 17th floor. 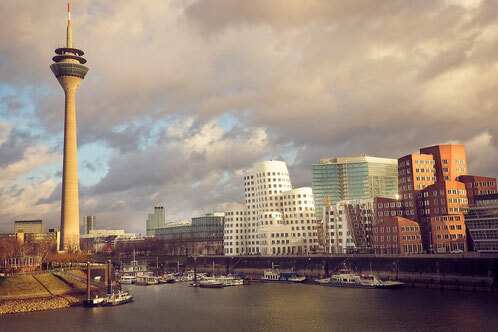 Perfectly located at the harbor of Düsseldorf guests can enjoy a breathtaking view on the Rhine River and the harbor with its modern architecture. 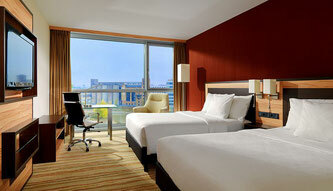 The hotel offers spacious, well-appointed and bright rooms as well as meeting capacities for up to 200 people. Amenities as a fitness area, sauna and international dining at Julian's bar and restaurant making you feel right at home. 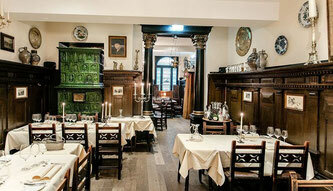 This historic restaurant Weinhaus Tante Anna is a jewel in the heart of Düsseldorf old town. Since 1820 every generation here had the same passion: to give the guest a pleasant time. High quality German and regional cuisine, an excellent service and a selection of 500 different wines is what the restaurant stands for. The 20° Restobar is tapas bar at the front and restaurant at the back part, both connected with a patio, the typical Spanish courtyard. At the modern and stylish restaurant surprising and creative variations of the Spanish cuisine are served in an exquisite yet casual atmosphere. Whether Tapas, Cocas or Especiales, only the very best and fresh ingredients are used by the Majorcan star chef Macarena de Castro. 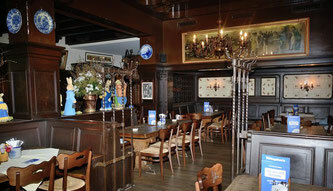 At the traditional restaurant Schumacher Stammhaus you can enjoy the delicious homebrewed top-fermented dark beer “Altbier” which is typical for the region. It perfectly fits the hearty and home cooked Rhenish specialties. During summer season you can enjoy both in the beautiful beer garden. Skål! The Apollo Variéte is situated perfectly at the bank of the river Rhine and is a unique location for an exclusive day or evening event. The theatre offers for up to 330 guests various usage possibilities with its theater hall, the panorama restaurant as well as its bar and foyer. The contrast of the modern, light flooded foyer and restaurant and the classic red and gold theater is particularly charming. The Oceandiva Futura makes a striking impression right away! Whether for company events, conferences, dinner, roadshows or brand events, this ship is literally a next-level event venue. It is capable of hosting up to 400 guests and offers multifunctional spaces in a futuristic yet warm design with huge windows and a panoramic view. 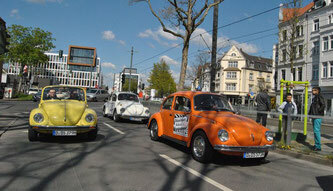 Explore Düsseldorf in a historic and colorful VW Beetle or Buggy! Follow our guide on attractive scenic roads through the town and the surroundings. Enjoy the view while listening to the information about the route and its attractions via radio. Experience the rich sound of the three 9-cylinder BMW engines lift with 120 km/h gently away. 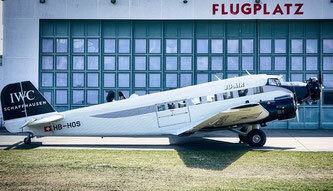 You will see Düsseldorf and its surroundings from a completely new perspective as the JU 52 flies significantly lower than today's airlines. Click here for more information of Düsseldorf.